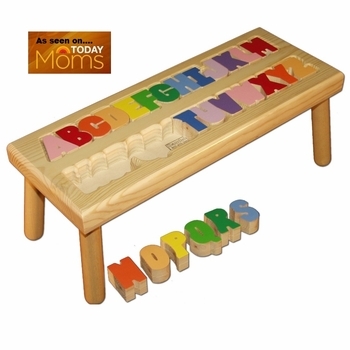 This unique baby gift is sure to delight a little one with their very own stool on which to sit and to learn their ABC's! It’s also great for improving a child’s hand to eye coordination with the puzzle pieces. Stands nine inches tall, the top measures 9” by 24” and it’s made from quality solid natural wood and hand painted with lead free paint. For an even more elegant touch you can engrave a heartfelt personal message or birth information on the bottom of the stool. Saw this gift featured on the Today Show. Even though it was last minute I placed my order and crossed my finger so I could have it delivered by Christmas for my daughter. I followed up with a phone call and the staff at Simply Unique confirmed that we could have this by Christmas. When it arrived, it was even better than the picture showed. My daughter has just started learning her A, B, C's and hasn't been able to put this gift down. In addition she now uses it everyday in the bathroom for brushing her teeth, washing her hands etc, etc. Now we don't have to force her to brush her teeth, because she loves the freedom the step stool provides her. I would recommend this gift to anyone who has a young child. ProsHelps learning and gives kids a sense of "I can do it," which they love! And so does my husband and I. This will definitely become an heirloom we will keep. I was pleased when this stool arrived. Everything was just as described and it is very well built. I like that it is made in the USA too. I would definitely buy this again.